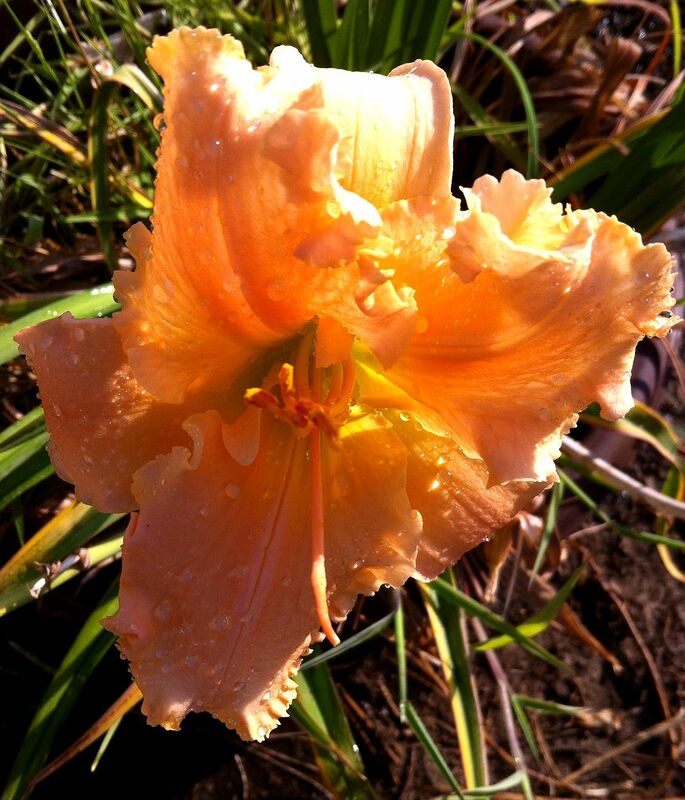 A daylily that Marion gave me is blooming, and it is really different. It’s beautiful, of course . . .
From any angle . . . The unique thing about it is that it is actually a triple bloom. It’s fully double, plus a little crest on top. You can see it best in this shot . . .
Maybe it’s not triple the beauty, but it’s a good-looking flower! 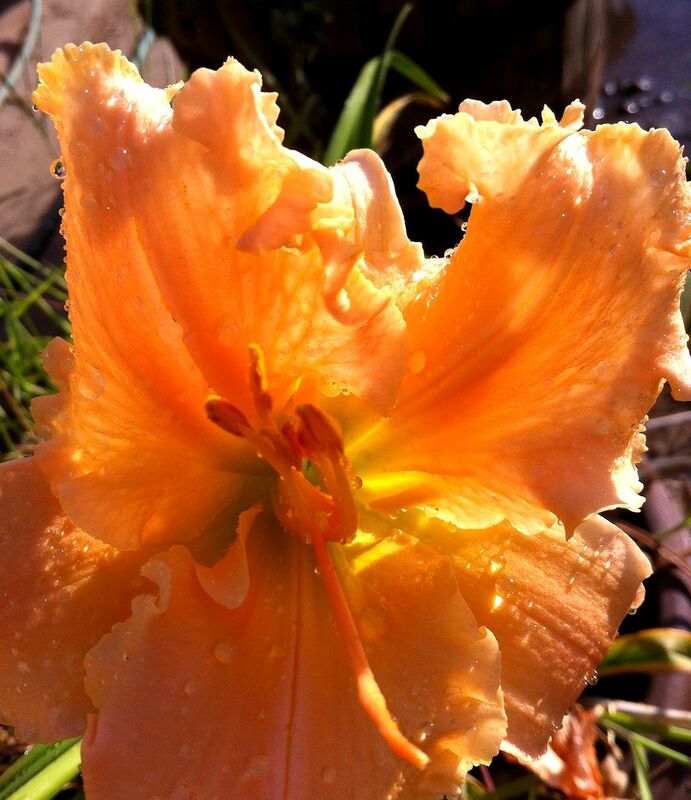 This is the time of year that I run out and get pictures of my daylilies before they’re gone. There’s a reason they call them daylilies. This morning, the miniature daylily bloomed. It’s a little beauty. It is pretty small, though, compared to its cousins. All of my few remaining lilies are gorgeous — though there aren’t many after the squirrel plague of a couple of years ago. The ground squirrels were killing full-grown trees, let alone delicious lilies. So the ones that are left are appreciated. You can see why . . .
We had an interesting night, a couple of days ago. About one o’clock in the morning, the dogs hit the dog door, yelling their heads off. When I looked out, I could see a single taillight at the end of the lane, where it drops off into the river. Pretty soon I could see flashlights bobbing around, and hear voices. Sure enough, someone had tried to drive down into the sand, and not made it very far. I could hear the engine revving, but they were stuck fast. We listened for a while, but it was pretty obvious they weren’t getting out on their own. Nor did they come up to the house for help — probably because of the dogs. They wouldn’t have gotten an enthusiastic reception anyway, at that time of night. Billy, though, being a merciful person, got on the phone and routed poor Scott out to come and help. He drove the backhoe over, and popped them out in short order. Scott has rescued people in that way quite a lot. It seems there’s always someone who thinks their pickup can handle the sand; especially of they’re full of . . . cheer. Nothing much going on, so here are a few pictures just for pretty. First, this backlit cloud. It was after the last windstorm, and the sky seemed inky-dark blue. There are also rainbow patches around the edges, which didn’t show up so well. It was a magnificent little cloud. The monkeyflowers are blooming, down by the river. They don’t look too much like monkeys to me, more like cheerful yellow snapdragons. Last, here are some shots of my red cactus that’s blooming now. Red isn’t my favorite color, but it’s sure gorgeous. Every spring, when my climbing Cecile Brunner rose is in full bloom, I get my camera out and record her glory once more. Cecile is not a flashy rose, with her tiny pink blooms, but she is faithful. When spring comes, she covers herself in pale pink blossoms. Cecile is an old rose, dating from 1881, with the climbing variety like mine first appearing in 1894. According to my rose book, she was named after the grower’s daughter; so she is definitely Cecile, and not Cecil. She came from Switzerland, and has many names. “Sweetheart Rose”, “Mignon” and “Maltese Rose” are among them. “Sweetheart” seems very appropriate when you look at the tiny, perfect buds. The foliage is green and lush, and Cecile is a tough, strong grower. Mine has survived several disasters, including fire and dust storms, and endured at least forty years of Bakersfield weather. Every spring she flings herself at the sky once more, and embraces countless tiny birds nesting in her branches. The individual flowers don’t seem to have much scent, but when she’s in full bloom, the spicy-sweet scent is lovely. Enduring, sweet, and faithful — what more can you ask of a rose? P. S. There’s water in the river again! Lots of water! 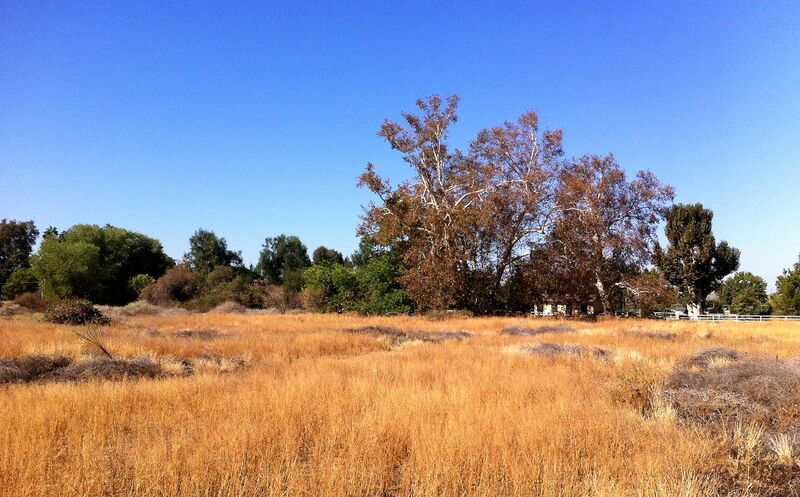 They’re predicting a heat wave that will last most of this week, with temperatures up to 106. We’ll hope it’s the last one this year. Monday was nice, and I got out for a brief ride. I took only one picture, featuring one of the wonderful old sycamore trees along the trail. Our sycamores always turn brown and start dropping their leaves early. This lets us see the beautiful branch patterns. I always think they look like white lightning, frozen in time. I think I’ve announced the last lily of the year earlier, but one brave daylily keeps putting out flowering stems. This, though, is the last lily on the last stem of the summer, so it may really be the finale for this year. The closer you get, the lovelier it is. See you next year, lily! Conventional wisdom in Bakersfield says that we never get true fall weather until after the fair, which begins on September 23 this year. Maybe this won’t be the last heat wave, though one forecaster announced that he guaranteed we’d had the last 110 or over temperature of the year. Thanks a lot. Right now, it’s 87, and it’s not even 9:30 yet. If my posts are intermittent this week, it’ll be because it’s Too Hot to Blog. Unless, of course, something Really Interesting happens!